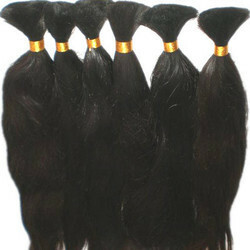 we are deal in Black Synthetic Straight Hair. With précised understanding of clients’ variegated demands, we are involved in presenting a Synthetic Hair. We feel immensely pleased to offer our customers excellent quality array of Synthetic Hair for Artist Brush that are available in many specifications. Synthetic hair. Bun with Ponytail embellished with crystals. Approx. Overall Hair Length: 5.5"
Color: All color made as per order. Type Of Packing: pvc with card. We Are Looking Buyer For Delhi NCR Only. 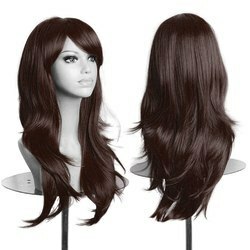 We are instrumental in offering premium synthetic hair wig. This synthetic hair wig is perfect for having a stylish hairstyle. This synthetic hair wig is extremely comfortable to wear for a long time and looks natural with its shiny texture.